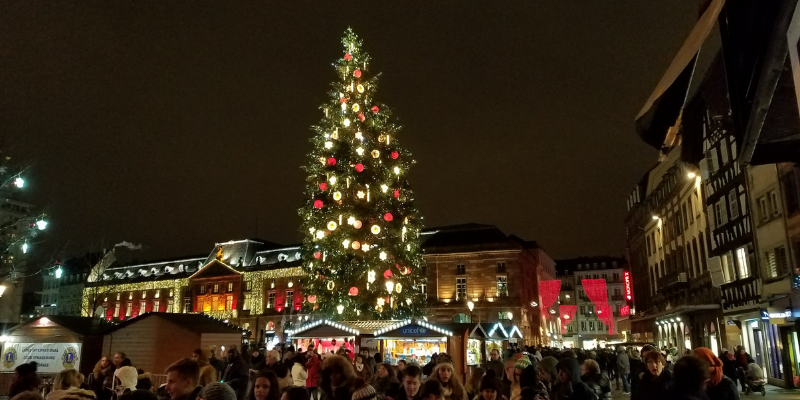 While my visit to Zurich got me into the Christmas spirit, Mulhouse is where I fell in love with Christmas Markets! 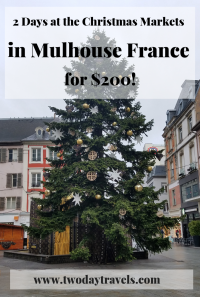 Mulhouse is located in the Alsace region of France, near the Swiss and German borders. It is the second largest city in the region (after Strasbourg). 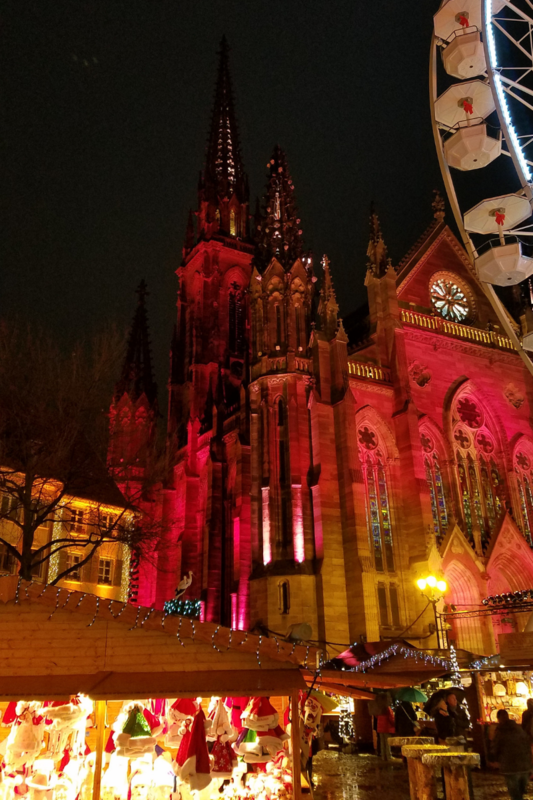 Like many cities in the Alsace area, Mulhouse has a long history of changing allegiance between Germany and France, often depending on which country won the most recent war. 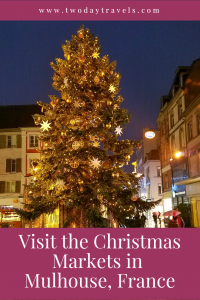 Sometimes referred to as the “most colorful” Christmas Market, Mulhouse celebrates its history in the textile industry by creating a unique Christmas fabric each year that is used to decorate the stalls and buildings around the city. The market itself is held at Place de la Réunion, the city’s central square in the Old Town area and surrounded by several important buildings, including the Temple Saint-Étienne and the City Hall. Located within Mulhouse’s City Hall is the Historical Museum. 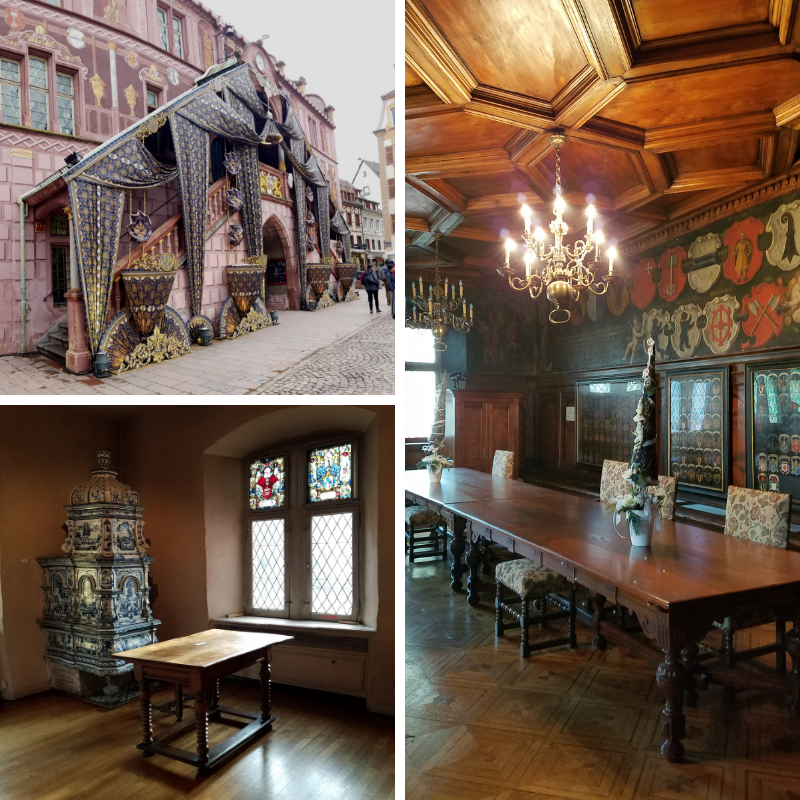 While the outside of the City Hall is richly decorated in the year’s fabric, the inside is a walk through Mulhouse’s past. 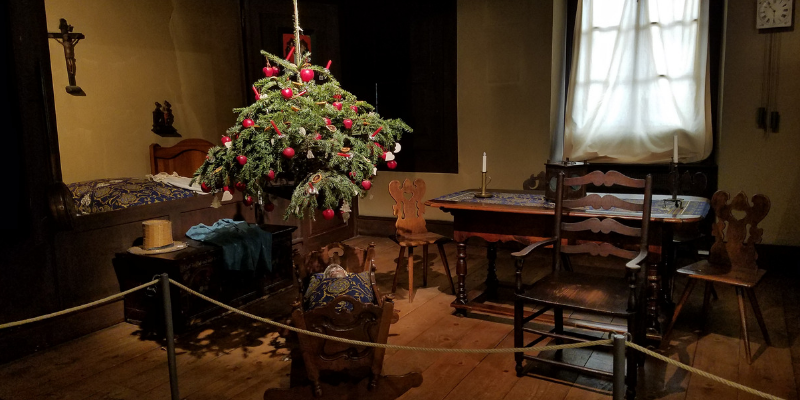 See elements of how residents used to live, and how they may have decorated their home for Christmas. During the Christmas Market, the Museum is open from 1pm – 7pm and the entrance fee is always FREE. 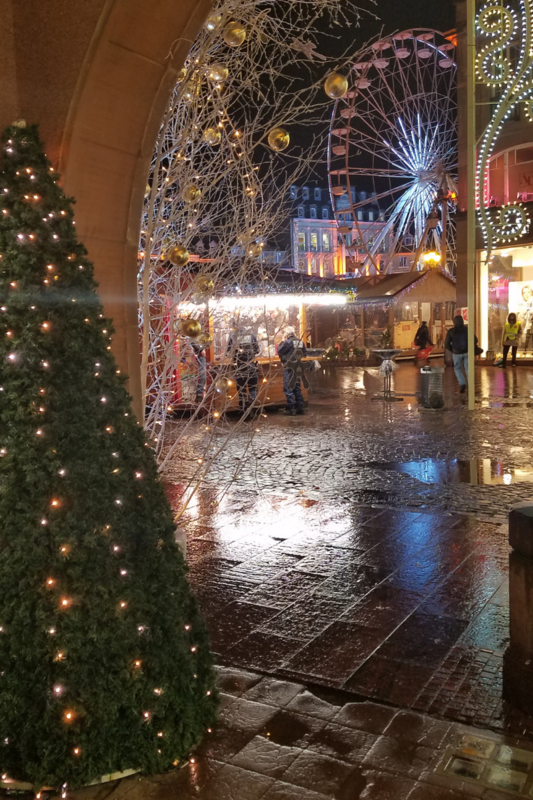 The entire area around the market is decorated with beautiful lights at Christmas time, that sparkle just a little bit more after a winter rain. 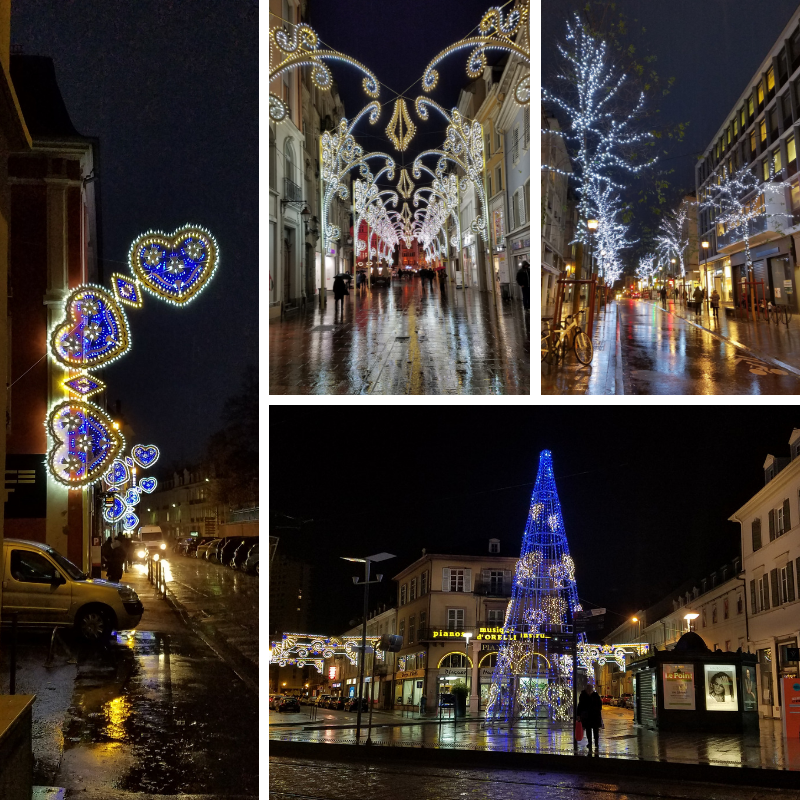 I walked around the square and was mesmerized by the lights in Mulhouse. Whether as decorations, on the market stalls or on the facades of the buildings themselves, everything was lit up with festive cheer. 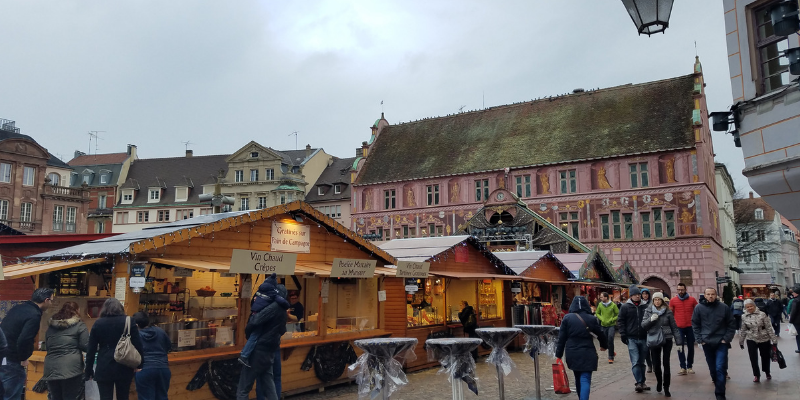 There are over 100 stalls at the Mulhouse Christmas Market where local artists sell their creations, homemade vin chaud (mulled wine) and other food items. I selected a broccoli & ham tartine and chocolat chaud (hot chocolate) for my treat this evening. 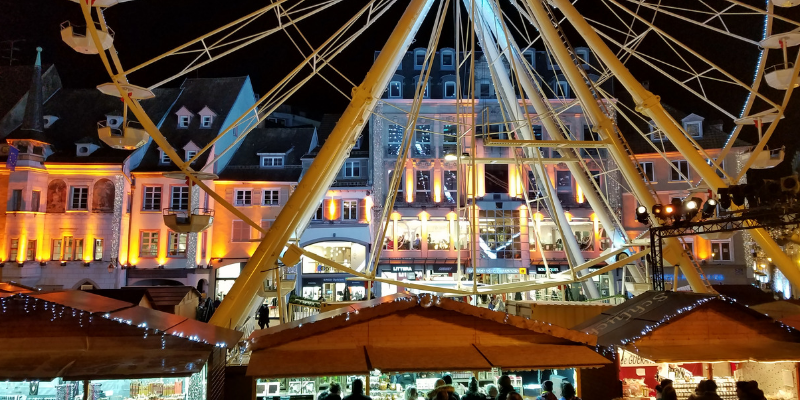 My first Christmas Market Ferris Wheel ride happened in Mulhouse! 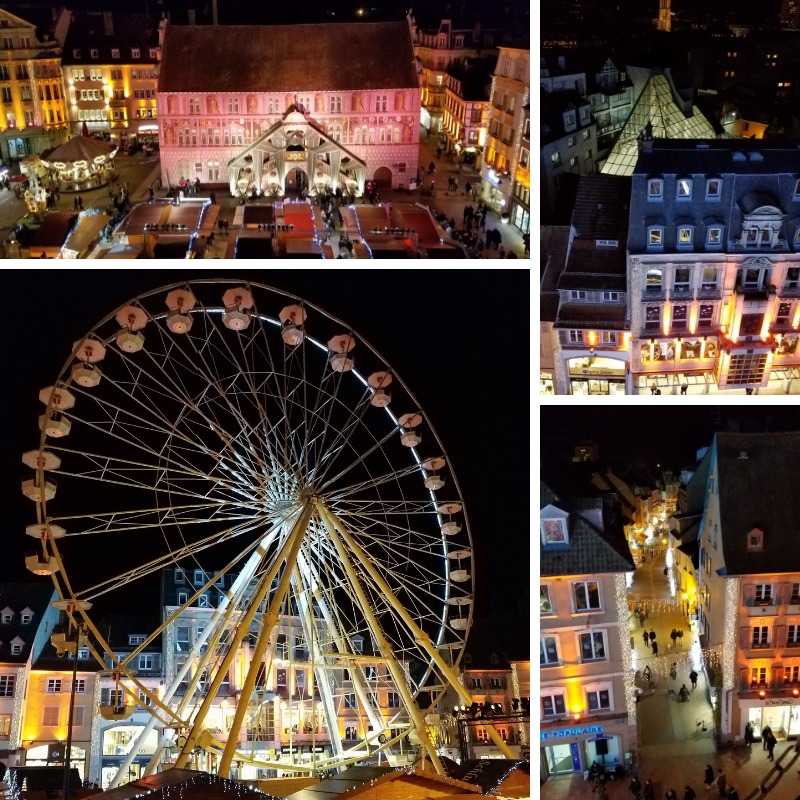 Riding to a height of 38 meters, you can get a gorgeous view of the market square, City Hall, Temple Saint-Étienne and over the rooftops of the city. 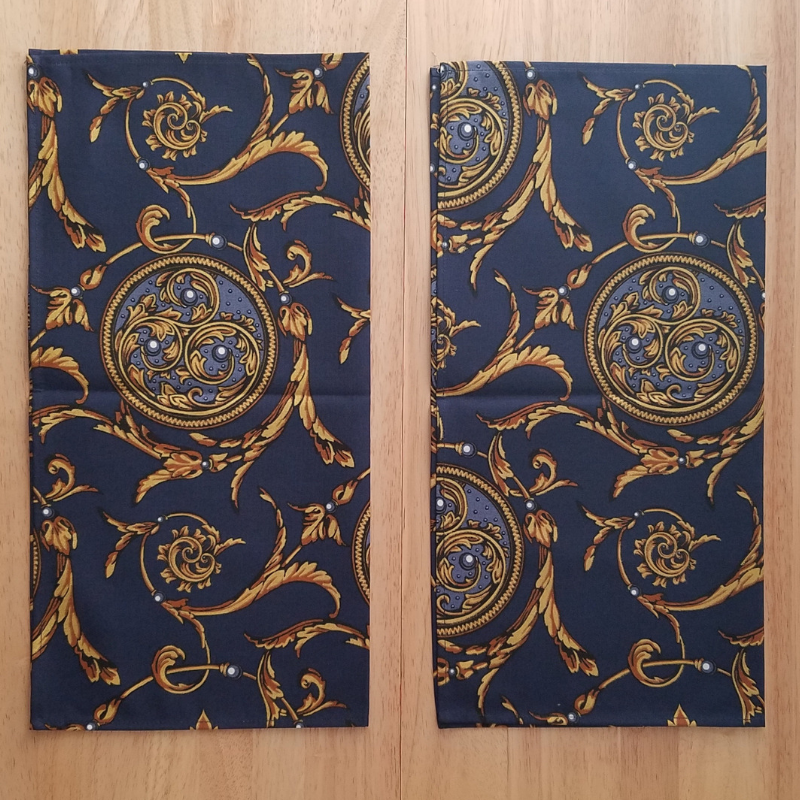 Fabric printing started in Mulhouse around 1746, and by the 19th century, the city emerged as a leader in the textile industry. The museum’s collection contains over 6 million samples, 50,000 documents and a timeline of machinery used in the production of printed material. One thing to note, all of the signage and information plaques are only in French. However, even with my rudimentary high school knowledge of the language, I was able to get the gist of the exhibit and enjoyed it immensely. You don’t necessarily need words to appreciate the beauty in something. The entrance fee is €10 ($12) and their ticket is actually a piece of printed fabric! So, you get to take a piece of Mulhouse with you. 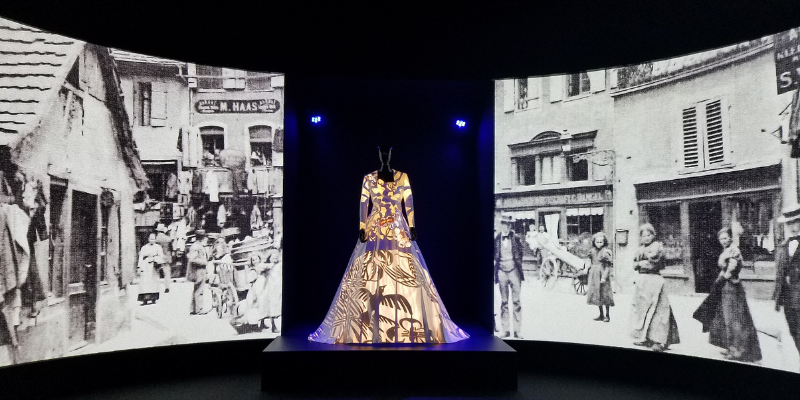 One of the exhibits, when I was there, was a multimedia installation showing a movie on either side and projecting different patterns of textiles onto the dress in the center. It was fascinating to watch! 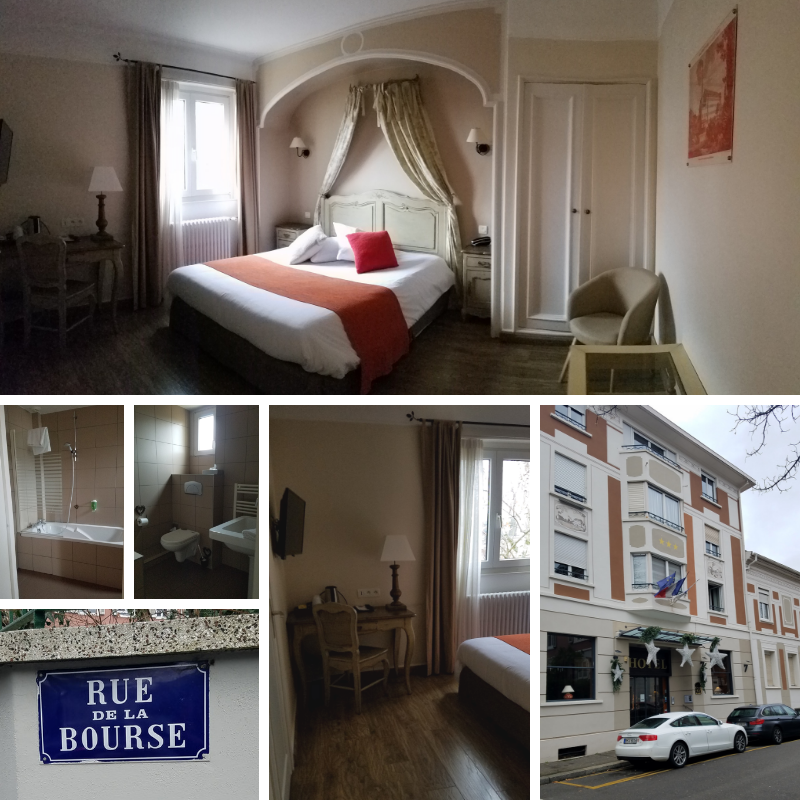 My hotel in Mulhouse was the Best Western Hotel de la Bourse. It was very spacious and even included a full-sized tub in the bathroom – not always a given in European hotels! It was centrally located just a couple blocks from the train station, making my arrival and departure very easy. 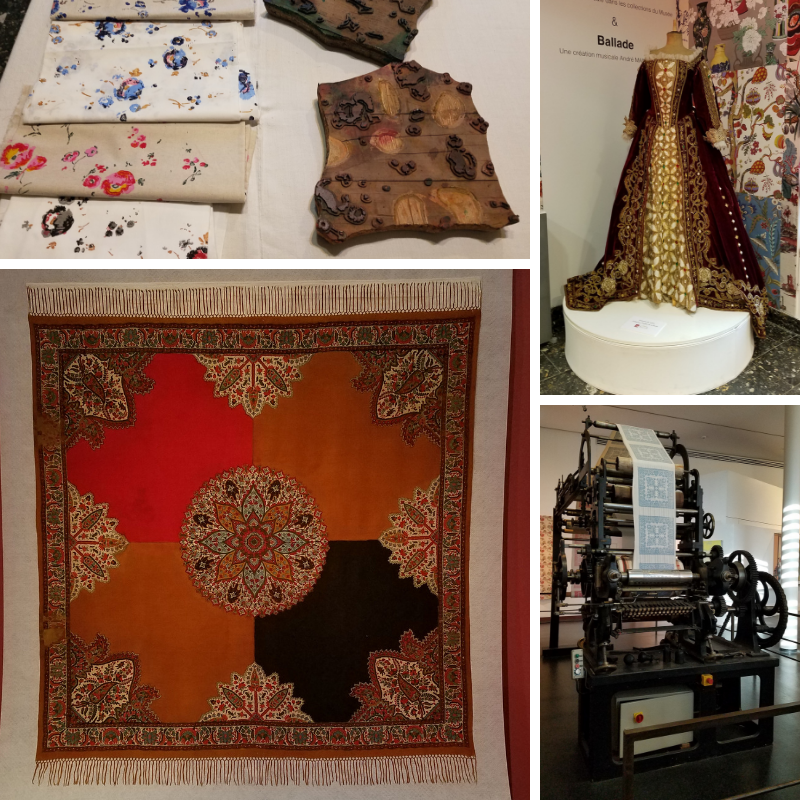 It was a short, easy walk to the Christmas Market and the Museum of Printed Textile was just around the corner. One thing to note, although they had a breakfast buffet available here it was not included in the price of the room so I elected to get my breakfast at a local restaurant instead. Before leaving, I took one last walk – and drank one last hot chocolate – at the Christmas Market. I also decided I wanted to take a piece of this market home with me, so purchased a pair of napkins in this year’s Christmas Fabric! 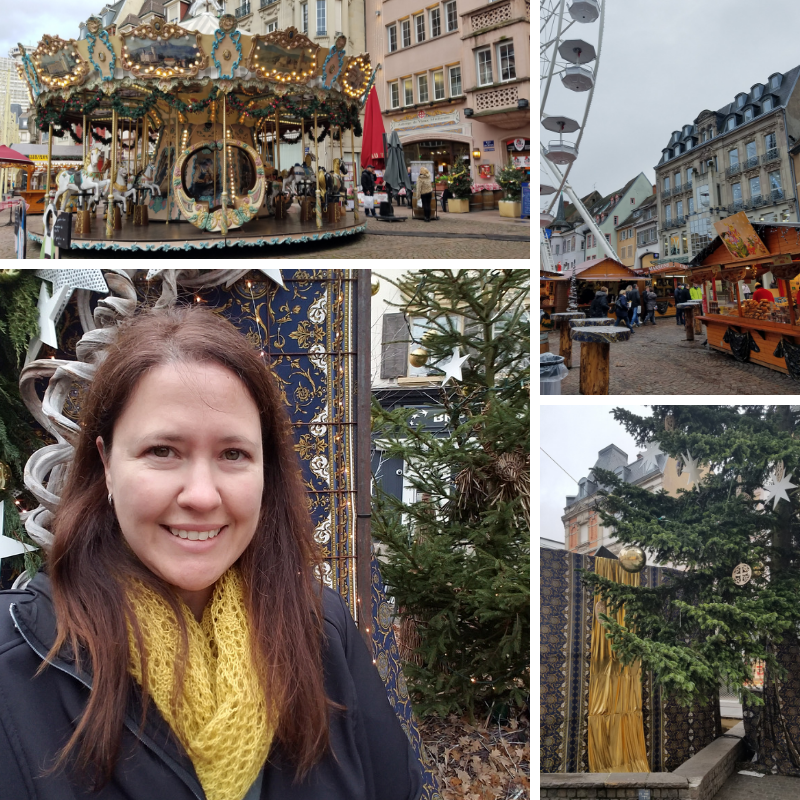 My budget for the two days I spent at the Christmas Market in Mulhouse came to a total of $197 – including the souvenir napkins! Your beautiful photos are making me reconsider winter travel. I do not normally travel internationally in the winter but this looks like a beautiful winter destination. Thanks for sharing your experiences. Thank you, I’m glad you liked my photos! I was a little nervous about going in winter but found it wasn’t too bad in the cities I visited. It wasn’t very snowy, although it did rain as you can see in the photos. And, I was happy to have the warmer scarf as the temperatures were in the 40s F (4-10 C). 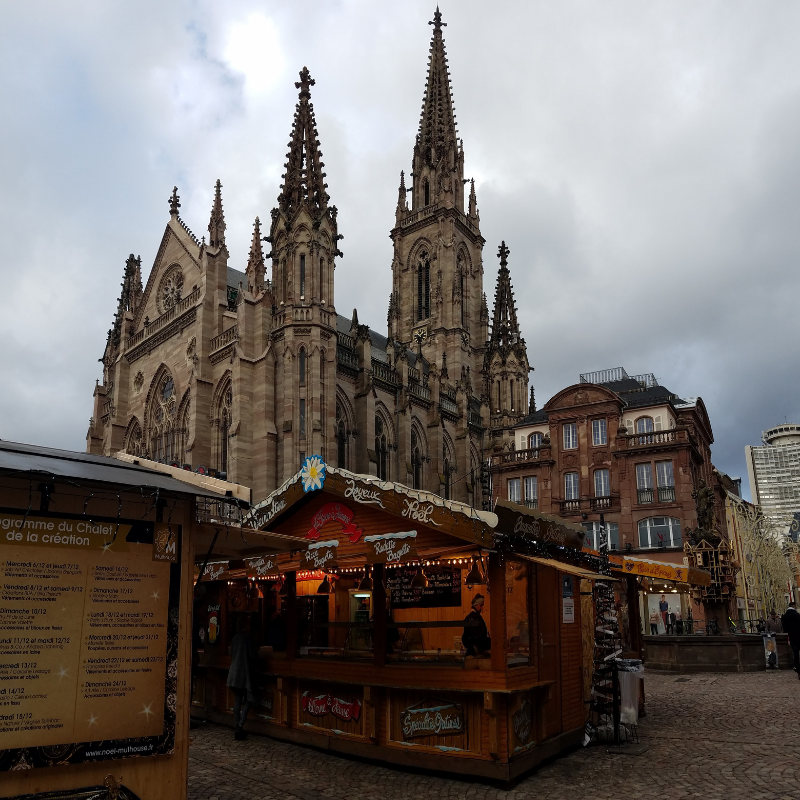 I been to Mulhouse Christmas market before but it was a few years ago and by the looks of it, it has got even bigger in the photos recently. How much wine did you drink in the end? Everytime I go to a French Xmas market (and going again this weekend coming in Lille), I always get a little bit typsey. 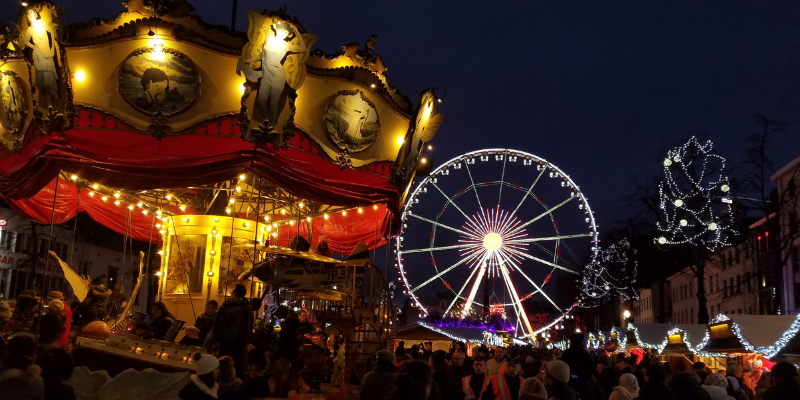 Who doesn’t love Christmas markets? Love how you brought this place to life with your pictures! The christmas markets around this region are just amazing. We visited the ones in Hamburg and Denmark last year and it was so magical. I imagine in this region of France it to be just as enchanting. The markets are magical, aren’t they? They make everything about the season bright and sparkly and joyous! Beautiful. I visited the Alsace region 2 years ago and would love to go back. The Christmas lights are beautiful against the old world architecture. And it was a cool idea to go up in the Ferris Wheel. I did that at Prater Park in Vienna and it does give you a whole new perspective. 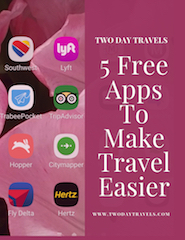 Thanks for opening my eyes to another great place to visit and an itinerary to boot. It is so interesting to see the old and the new together like that, isn’t it? I look forward to visiting the Vienna markets one year, I’ve heard they’re amazing! We LOVE Christmas markets, especially in Germany. 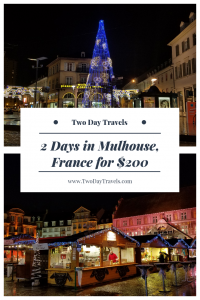 Your photos and description of Mulhouse make it sound incredible. The Alsace region is so amazing and picturesque. 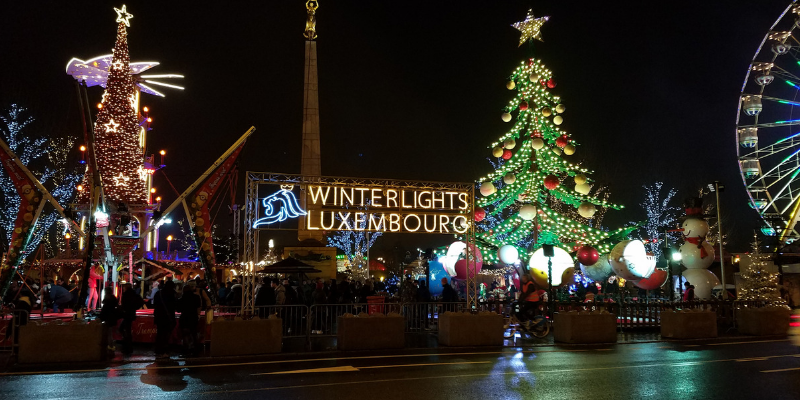 I’ve bookmarked this post to revisit for perhaps a Christmas Market trek next year. Oh, I do hope you make it there, it was so much fun! Although I’ve heard the ones in Germany are amazing and I look forward to seeing them one year soon! 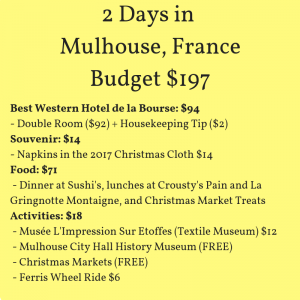 Loved how you have highlighted the places / activities and the cost at Mulhouse. The Christmas market and the place look so beautiful and I can only imagine the experience here. I get a lovely sense of it being so festive, colorful and fun. Thank you! Yes, it was absolutely festive and so colorful with all of the lights everywhere! I spent six months living in Strasbourg nine years ago, and this post made all my great memories of the Alsace region come flooding back! I was not there for Christmas but I hear it is a magical experience, and it sounds like you really captured the wonder it is meant to hold. Beautiful photos, too! 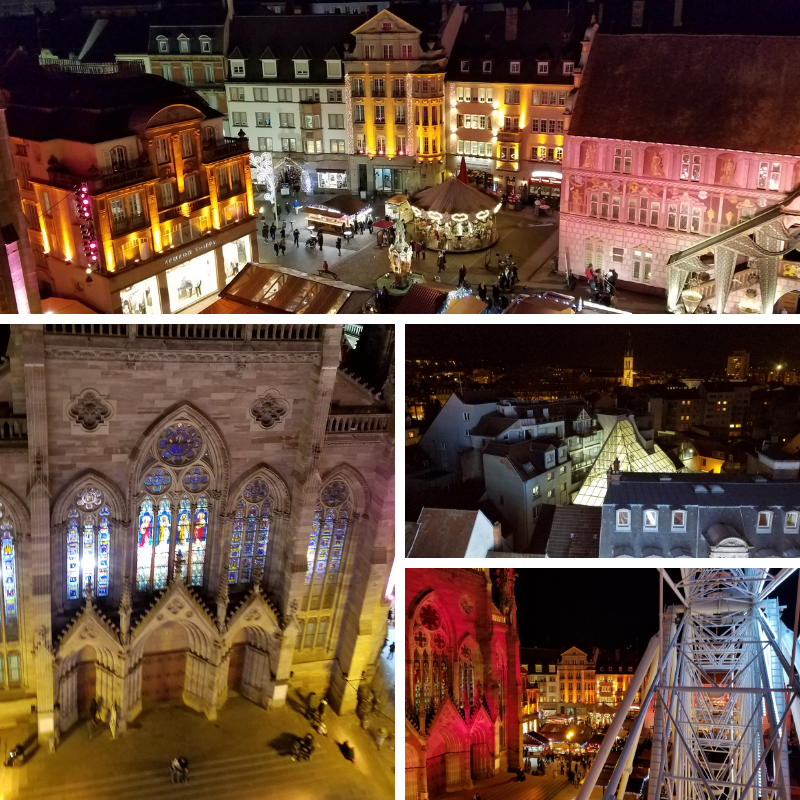 How incredible to spend 6 months in Strasbourg! The Alsace area was beautiful at Christmas time, but I imagine it is just as much or even more so in the spring and summer. This is such a helpful list; I like the way you laid everything out with the prices. 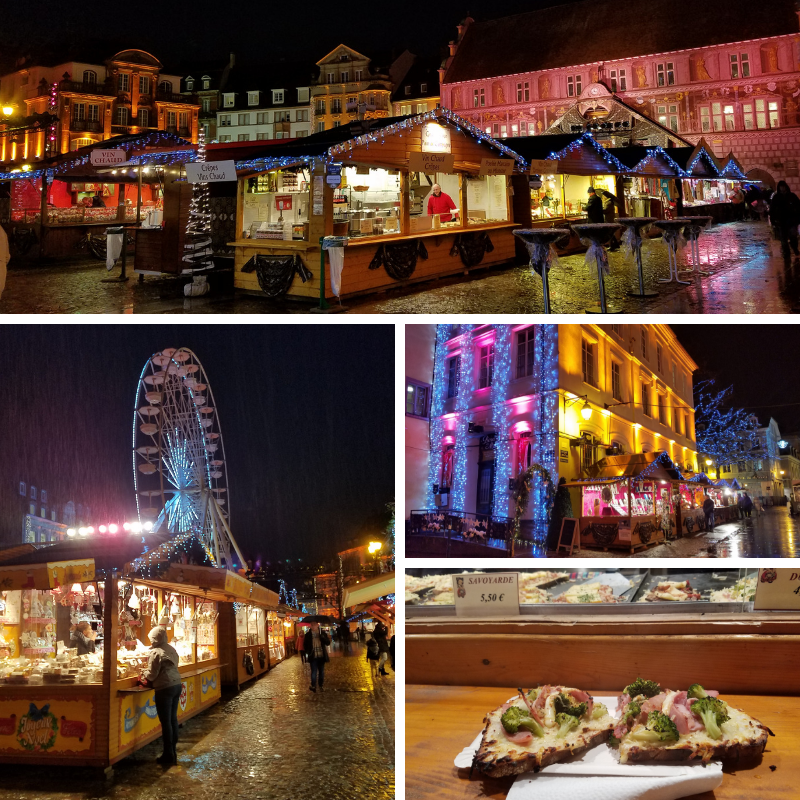 Going to a Christmas market in Europe has long been on my list! 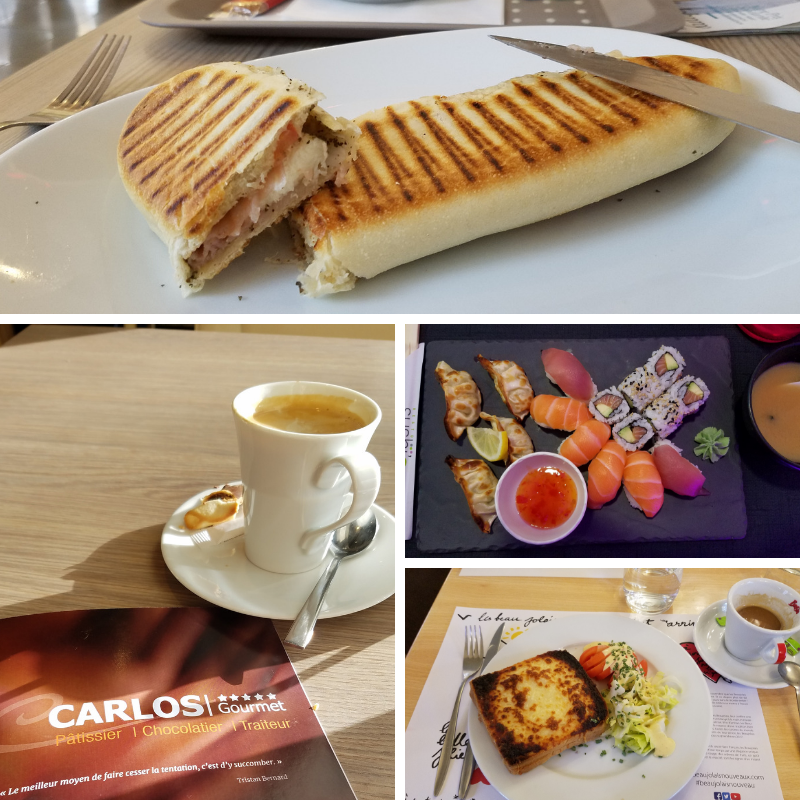 It’s quite impressive how many free things there are to do in Mulhouse. Do you know if there are hostels in this region of France? I was pleasantly surprised at how many free things I could find – the Christmas Market itself being the highlight, of course. I don’t usually research hostels so not sure what they have but I’d be very surprised if they didn’t have one or two. Who doesn’t love cute little Christmas towns like this one! I was curious if you caught some cool views from the Ferris wheel and it looks like you did! I need to make a trip to Europe for the holiday one of these years! Oh, yes, if you get the chance to go to the European Christmas Markets one year, I’d highly recommend it! 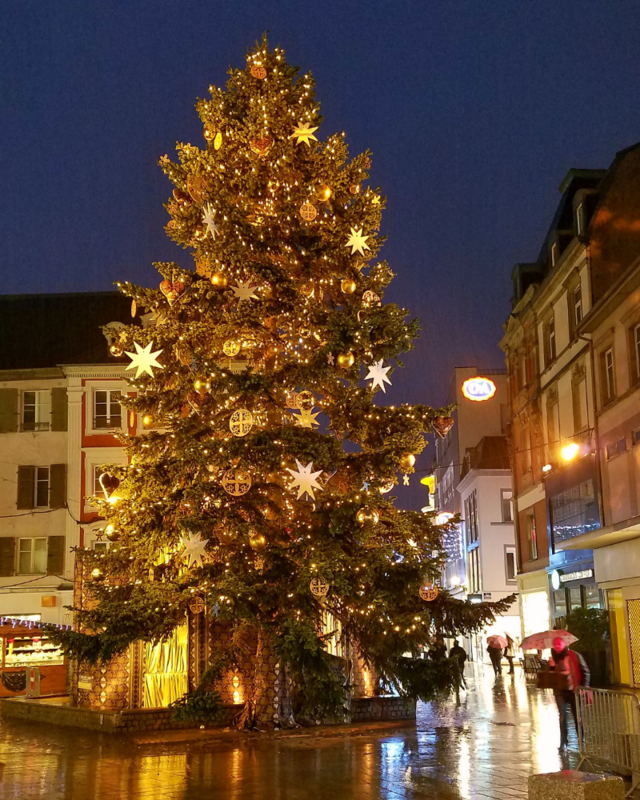 We were backpacking Europe last year in November and just missed so many Christmas markets..and German Christmas markets look the best! Great money advice too! I haven’t had the chance to visit the German ones yet, but I hear they’re amazing! Thank you! I would highly recommend visiting one/some if you get a chance! I love how many of these are FREE or really cheap. I have one Christmas market near where I live and it’s like $40 and not even one-tenth as good as traditional European Christmas markets. I hope to visit these markets one day! I love that the Christmas Markets in Europe seem mostly to be free, which makes it so much easier to attend!